We need much more wind power. When wind power goes wrong, it kills the odd bird or maybe the occasional worker. Some people don’t like the look of the towers. But we need power, and wind power doesn’t destabilize the climate, and it doesn’t irradiate hundreds of square miles of farmland. So this collapse in investment is terrible news. 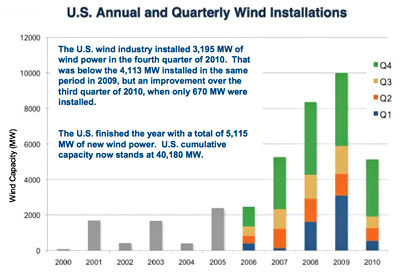 I understand why the US congress and the Obama administration was not able to pass climate change legislation, but it’s a terrible commentary on their energy/environmental policy that they weren’t even able to maintain the pace of growth in wind installation. What caused this? Wind projects have big capital requirements and long lead times, of course, so this could just be a delayed reaction from the 2008 financial crisis. If anybody out there can offer up a better explanation, I’m all ears.